This landmark is unfortunately surrounded by heavy utility wires. The extent of my rant would be to say that in one of Georgia’s architectural showplaces such as Milledgeville, an urban plan to bury these wires would be something to seriously consider. 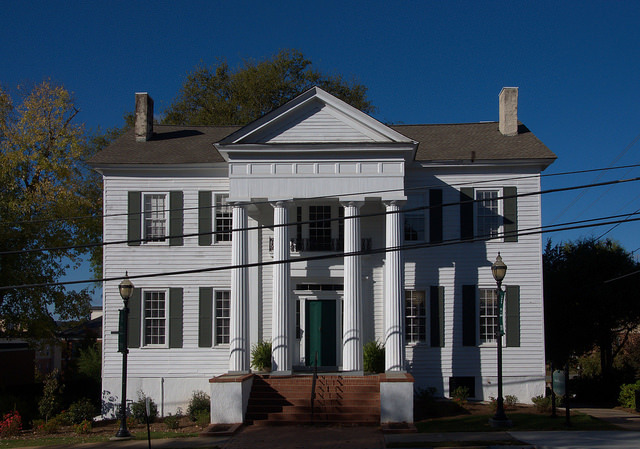 The columns and pediment are thought to be later additions to what appears to have begun as a Federal Style house. After over a century-and-a-half of ownership by Isaac Newell’s descendants, it’s now the Office of Admissions of Georgia College & State University. Fabulous!! And like you, I hate the wires!! !